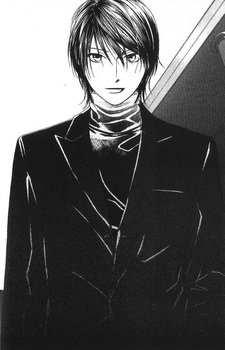 Reiji Arima is Soichiro's father.Reiji Arima (有馬 怜司 Arima Reiji) is Soichiro Arima's estranged father. Reiji was the illegitimate but favored son of the Arima patriarch whose mother tried to drown herself and take Reiji with her. Reiji kicked her in the face to save himself, a horrific memory that haunts him for the rest of his life. Although a talented musician, he grows to lead a life of a delinquent and is seduced by a beautiful gold-digger named Ryoko, who gets pregnant. Reiji names it Sōichirō after his brother Shōji, but has nothing else to do with the child. Years later, Reiji learns Ryoko was abusing his son and had abandoned him. Unable to care for him, Reiji gives the child to Shouji then moves to New York City. There he becomes a famous jazz pianist. He returns to Japan when Soichiro is in high school and "kidnaps" him to force him to spend ten days with him and later helps protect him from Ryoko. He threatens to kill her to keep her from hurting Soichiro again, eventually allowing her to live when Soichiro stops him from shooting He's a very famous pianist living in America and only appears in the manga.